a selection of exceptional Australian talent. and within Australian elite sup racing. NSP DC 17'10 x 24.5"
Our crew includes Travis Grant (NSP DC), currently positioned as the world’s number one stand up paddler. Travis recently won one of the toughest races in the world, Molokai, in July 2015 with a 15-min gap in front of Kai Lenny riding a NSP DC production 17’10’’. Travis has been riding NSP DC designs for 4 years. He brings a wealth of experience to the team from racing some of the most prestigious global races. We’re super-proud of Travis. He’s a stand-out athlete and extremely talented. 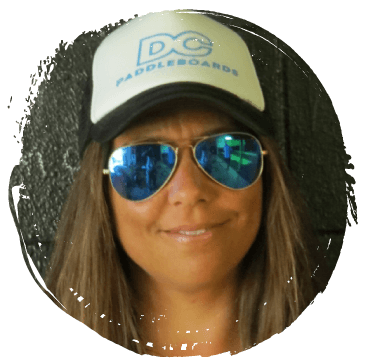 We’re equally-stoked to have Stimo and Monica de Araujo riding DC Paddleboards. Each member of the crew plays a significant role within research and development for new design work. We simply can’t compete with the big guns; however, we do have a brand and product that talented sup athletes want to work with. One of the advantages that Dale offers his team is that he designs and shapes boards customised for the team rider. Our team choose us, which is an enormous compliment to the business. Over the years, we have had a selection of the worlds’ best sup athletes riding for DC paddleboards, to include Beau O’Brien, Kelly Margetts and Terrene Black. We’re selective about who we work with and we’re always on the lookout for new talent! With a lifelong connection to the ocean, this country boy grew up in Bunbury where his love of the ocean began. It started with crafting wooden fins into foamies to catch a few waves at his local break. He then moved into converting surfboards to sailboards in an old shed in Applecross, WA, only to be seen (wellnot really) belting across the river in the dark of night. A back injury got him into supping and he has never looked back. Stimo’s surfing background has made it an easy transition into sup. He can either be found down winding in a 30-knotter off the shores of Swannie and City beaches or surfing at his local breaks. He loves testing his ability with sup technical racing as well as competing in Bop and Marathons frequently. Mix this up with a bit of cross-fitting and it’s nothing but ‘Happy Days’. If you were a sea animal, what would you be? His passion for the sport spills over into his local sup community as an invaluable member of SUPWA and Downwinding Training Coordinator for the City Beach Drum Liners. There isn’t a day that goes by that Stimo is not encouraging people from beginners to the elite to get involved with the local training squads and participating within events. Stimo has been appointed team captain representing WA at Australian Titles for the last two years and leading the team to achieve excellent results. 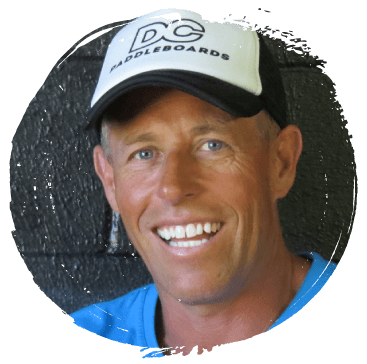 His knowledge of surfing and supping plays a key role as a team rider with DC paddleboards. Stimo works closely with Dale on design, product research and development. Stimo is an absolute asset to our team and a valued member of the DC family. From a very young age, Monica learned to love and appreciate the ocean. Coming from a windsurfing family, she would go out on her mum’s board as a young girl still wearing floaties! Most of Monica’s childhood was spent on an Island off the coast of Brazil called Ilhabela. At 15, she started windsurfing and this passion quickly became an obsession. The first race Monica entered was called the Sao Paulo Windsurfing Championships, where she placed 2nd in the state. In 2005, she packed up her life and migrated to Perth, Western Australia. She fell in love with the city and the extremely good wind conditions. Four years later Monica was introduced to SUP by one of her windsurfing mates and she became totally hooked on the sport and has never looked back. Whilst she had years of windsurfing experience, surfing and stand up paddling were completely foreign to her. Everyone who is happy in their heart and has froth in the surf inspires me. This lady was not one to shy away from a challenge. Combining her passion for the ocean and skills from years of windsurfing, she picked up the skills she needed quickly and hit the water running. Monica has paddled internationally including Hawaii, Sumatra, Maldives, Brazil and Bali and has travelled extensively across Western Australia, chasing waves. It was 2013 when she decided to start competing locally. The WA State Round in Mandurah, which she won. Monica backed this up in 2014, competing in WA State Rounds, she placed 1st, becoming the West Australian State Champion. In 2015, she placed 1st. Once again securing her position as WA State Champion. Having the taste of success, she recently participated in a 2-month elite sup training program out of the Australian Titles. Her hard work and dedication to her training and sport secured her a 4th place finish at Australian Nationals, held in Currumbin, Queensland, 2015. Monica is certainly a talent to watch, her career like her paddling has taken off quickly. My grandfather was a founding member of the Torquay SLSC. I started out in SLSC in Mermaid Beach and as a young kid, I could see the older kids cutting it up in the surf and I wanted a piece of the action. As a grommet, I was riding for Billabong and Hot Tuna in no time at all. My passion for surfing set the scent for various companies I owned - Doctor Ding Surf Repairs, Shapetech, DC Surf Design and Chapman Surfboards. Surfing was my sport and my work! Joe Bark - He’s a gentleman and well-respected globally. He still competes in as many races as he can and loves his sport. He’s a true inspiration. Secondly, Jerry Lopez - I met him a couple of years ago. He has his heart in the right race and is an unbelievable waterman. Thinking about competing at Olukai, Hawaii this year or maybe Hood River, USA. Visiting my daughter in Canada and joining her on the slopes. A dolphin - because their happy and seem to always get good waves. Old rock and new tunes on my Apple playlist. Corona by night and a banana-smoothie by day. One day, I was in Burleigh surfing my local break and noticed Jamie Mitchell smashing it on a surf sup. Once again, I wanted a piece of the action. I decided to make a surf sup. My first board was a 12’6 x 30 ‘’ with a super wide square tail. It didn’t work. So I decided to design a few 12’6’s and that’s where it all started. Travis raced on one of my boards in Hawaii, Battle of the Paddle, very early in his career and secured 2nd place. That passion then turned into a big business and I have Jamie and Travis to thank for that! I’m stoked that I have the opportunity to shape for NSP in Thailand 3-4 times a year and I try to compete in as many races as I can to support the sport and represent both my label and DC NSP. Hopefully in the future, I can get over to some European destinations to compete and continue to experience different parts of the world and conditions on my boards. Great Barrier Reef Hekili Ocean Challenge, Cairns - 1st place in the open category. Also secured 1st place over the line. Great Barrier Reef Hekili Ocean Challenge, Cairns - 1st place over 40’s riding a 14’ dugout. Also secured second over the line.